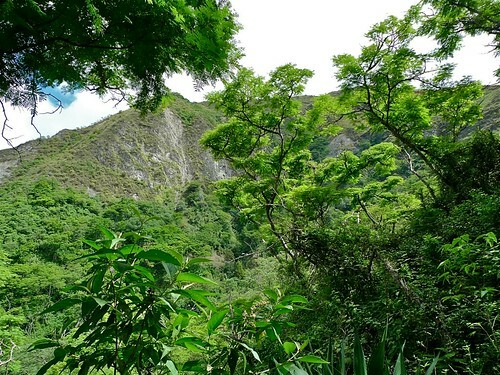 They have a video series that they post regularly and since many of them are from/about Vilcabamba, I was pretty much guaranteed to come across them eventually. The one that caught my eye is the video in which they are visiting their new land for the very first time. Actually it was the garden that made me start to salivate, and so; I'll share it with you! I know. It's stunning there. I can't look outside at the snow and dismal brown trees that grace my city, if I do... I might just tear up! After watching the video I had to go and check out their website a little more fully. They have... a LOT of products. All raw, many of which are organic. In fact, there are 256 items that come up just when you search 'organic'. I couldn't tell you about their shipping costs, but I'd say they are definitely worth checking out. As I was browsing around I came across a list of products that they are offering 'at-cost' this month. It's not just one or two items either, so I figured I should definitely share them with you! If you're interested check out their 'at cost' specials. Cool right? Over the past few weeks I have been debating whether or not to begin the adventure that is juicing. My sister has been juicing nearly every fruit/vegetable imaginable for ages and swears by it. I know for a fact that I don't eat nearly enough vegetables and I don't mind the juice that she makes! But, is juicing what "I" need? I'm still deciding, but in the meantime I figured I would share some of the things that I am learning! Why Should You Juice Vegetables? Everyone knows that you're supposed to eat 6-8 servings of fruits and vegetables a day. How often does that actually happen? I know personally I'm lucky if I eat that much in a day once a month! Juicing allows you to consume the benefits of all those vegetables in a single glass. It is way easier to get all those nutrients into your body. Your body can absorb the nutrients more readily in juice form; so you're not wasting nearly as much. You will end up eating a greater variety of fruits and vegetables than you normally would. 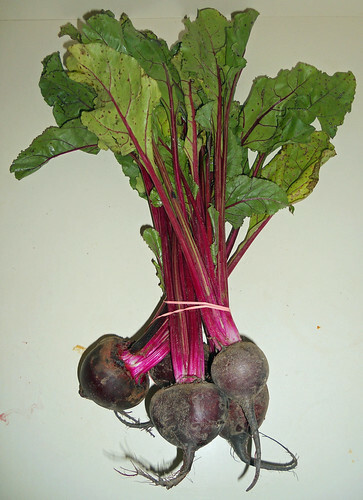 Juicing is also beneficial because it uses fresh uncooked fruits and veg. Once a food has been cooked it loses its micro-nutrients, but not if it has been juiced! Everyone that I know that juices has told me that they feel more energetic, healthier, they recover more quickly when they get sick, etc... I've seen how much of a difference it makes in their lives and really believe that it does. I don't think so many people would go through the 'hassle' of it if they didn't find it beneficial. Why juicing and not making smoothies? 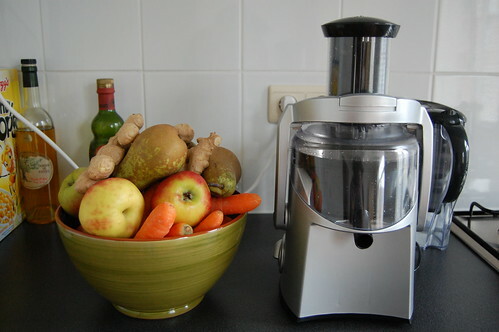 I'm not 100% clear on whether or not there is a big difference between blending and juicing; except that some blenders can heat the food resulting in a loss of nutrients. For me, the choice is more personal. I enjoy smoothies but I cannot get them down very easily. I can drink a whole lot more juice because it isn't thick; so juicing would be a better choice for me. So what is taking you so long to decide? I 'know' that juicing would be a good idea; but I'm a pretty busy person. My biggest concern is whether or not I would have the time/inclination to do it. I have no desire to spend the money on a good juicer only to use it for a few days and decide it is too much of a hassle. 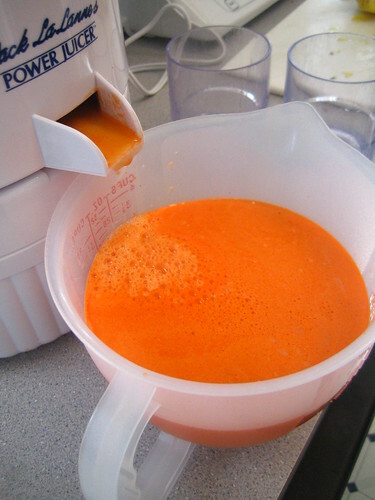 You have to clean the juicer RIGHT away or it will mold, something you want to avoid at all costs. Will I have the time to do that? One of these juicers is just over $100 - The other... over $300! That is a lot of money for me to invest before I figure out what I really need. If you are thinking about juicing you should check out what Dr. Mercola has to say about it. I'll keep you posted and share any new juicing information that I come across! The following books are all from the Chapters website - (Which is handy if you are Canadian because they offer free shipping on orders over $25.) The first book deals with travelling and organic food, the second and third are little more scientific. "This book is destined for vegetarians, vegans, and people who want to stay healthy by eating better foods obtained in compliance with the laws of nature. Although Paris is not yet a vegetarian haven like London or New York, vegetarianism is now booming here, as well as the use of organic foods in traditional restaurants. This is very good news ! Vegetarian Paris has now become Vegetarian and Organic Paris to include traditional French restaurants using organic products and being vegetarian-friendly. This year, I have added a "Read Me First" section in the book. Here, I have grouped information about what continues to be hard to find in Paris, including where to find wheatgrass juice, have an organic breakfast, eat without gluten, eat organic crepes, have organic Italian meals, have meals with many sprouted seeds, buy organic products with your Amex card, etc. In addition, the section includes a useful list of the restaurants that no longer exist but continue to be mentioned on many websites. In the first chapter, "Restaurants", you will find addresses, telephone numbers, business hours and closest metro stations of Parisian restaurants. Also included are brief examples of meals proposed and price, the percentage of organically grown products used in the preparation of meals, the kind of restaurant (vegetarian, vegan, macrobiotic, vegetarian-friendly) and website addresses, when available. You will also find pictures of the restaurants listed. The second chapter lists organic and non-organic juice bars and soup bars and quality vegetarian (or vegetarian-friendly) snack bars. Included are the names, addresses, business hours, phone numbers, and closest metro stations, as well as examples of meals/juices/soups proposed with their prices and organic ingredients used. The third chapter lists organic food shops with their names, addresses, business hours and phone numbers. When available, the number of seats for eating-in and websites are given. In the fourth chapter you will find listed the artesian wells still open to the public. Here you can get pure spring water for free, and chat with French people. In the fifth and sixth chapters, you will find lists of the main organic bakeries in Paris and information about organic food open markets. At the end of the book is an English-French food dictionary to help you get what you really want. I hope that Vegetarian and Organic Paris will help you enjoy even more the City of Light. Bon voyage and bon appétit!" This book is currently 24% off! "Organic gardening and farming with organic systems such as Biodynamic, Biointensive, Forest gardening, and more. Organic techniques such as Aquaponics, Companion planting, Intercropping, Multiple cropping, No-dig gardening, Xeriscaping, and much more. Organic pest and weed controls such as biological pest control, drip irrigation, dynamic accumulator, mulch, tillage and much more.Project Webster represents a new publishing paradigm, allowing disparate content sources to be curated into cohesive, relevant, and informative books. To date, this content has been curated from Wikipedia articles and images under Creative Commons licensing, although as Project Webster continues to increase in scope and dimension, more licensed and public domain content is being added. We believe books such as this represent a new and exciting lexicon in the sharing of human knowledge." "This book begins by explaining the relationship between sustainability and the organic agriculture movements. It delves into the regulations and associations that monitor these products. It then explains how organic agriculture works and provides examples of some products. Project Webster represents a new publishing paradigm, allowing disparate content sources to be curated into cohesive, relevant, and informative books. To date, this content has been curated from Wikipedia articles and images under Creative Commons licensing, although as Project Webster continues to increase in scope and dimension, more licensed and public domain content is being added. We believe books such as this represent a new and exciting lexicon in the sharing of human knowledge." Thanks for tuning in, see you Wednesday!